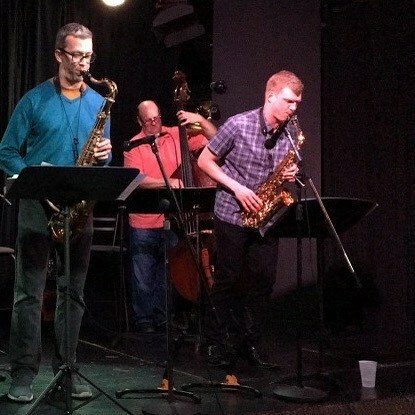 Saxquest is excited to host Joel Gordon’s “Happy Habitat”, a Kansas City-based “chordless” jazz quartet this Saturday afternoon, August 25, from 2-4pm at Saxquest on Cherokee. As always, this will be a free concert open to the public. Its informal and will be open to questions with the artists. Come on out and out check out some exciting and inspiring new music!! Happy Habitat formed in fall 2017 as a new music ensemble creating original and creative music. The absence of a chordal instrument frees up the musicians to explore and lead the group in different harmonic directions while improvising. A perfect blending of traditional jazz with ever evolving harmonies and creative ideas, this will be a Saxquest event not to miss!! This performance will feature, leader Joel Gordon on alto saxophone, Tim AuBuchon on tenor saxophone, Ben Wheeler on double bass, and Kaleb Kirby on drums and percussion. The group performs almost all original music, composed by the members of the group. The goal of the Happy Habitat is to express the humor, quirks, and joys that music can bring through timing, harmony, and improvisation.